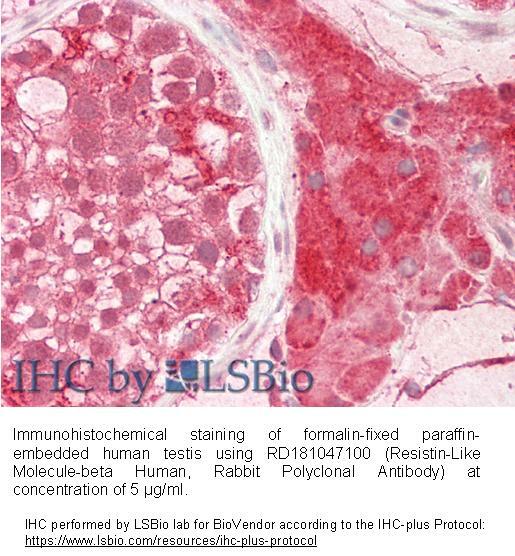 The antibody was raised in rabbits by immunization with the recombinant Human RELM-beta. The immunization antigen (11 kDa) is a protein containing 102 AA of recombinant Human RELM-beta. C-Terminal His-tag 12 AA (highlighted). Immunoaffinity chromatography on a column with immobilized recombinant Human RELM-beta. RELM-beta (Resistin-Like Molecule-beta) is a member of a recently identified family of secreted proteins containing a conserved cystein-rich C-terminus. The RELM family consists of resistin (also called FIZZ3), RELM-alpha (FIZZ1), RELM-beta (FIZZ2) and RELM-gamma. Only resisistin and RELM-beta were found in humans whereas all four RELM family members were identified in rodents. RELM-beta appears to be produced as a homodimer exclusively by intestinal goblet cells and can be found in high quantities in stool. Remarkably, stool of germ-free mice displaying sterile intestinal tract does not contain RELM-beta until bacterial colonization takes place after pathogen-free mice entered natural environment. Some, but not all, colon carcinoma cell lines secrete RELM-beta into the cell culture supernatant. The physiological function of RELM-beta is not known. High doses of recombinant RELM-beta showed hyperglycemic effects including lowered glucose disposal and increased hepatic glucose production in mice.